In Savannah’s 2.5 square mile Historic District, picturesque places and images unfold around every turn. Street after street of stately historic homes surrounding shady squares centered by impressive statues all have history to tell. Brilliant flowers cascade over wrought iron trellises; Spanish moss veils ancient live oaks; showy white magnolia blossoms punctuate glossy, dark green leaves. Dolphin downspouts, symbols of good fortune, are functional art and hauntingly beautiful statuary fills garden cemeteries. Along the vital river, ships from everywhere make the journey into port; ancient brick buildings climb up the bluff; cobblestone streets are polished with age. Just outside the Historic District, long vistas of tidal marsh laced with meandering estuaries are dotted with motionless wading birds. Historic forts and lighthouses stand as silent sentinels of time past. On the coast, expansive beaches stretch for miles, fishing boats head out for a day’s catch, bottlenose dolphin leap from the sea. Originally, 24 squares were laid out by James Oglethorpe in 1733 in his plans for the settlement on the bluff on the Savannah River. His was a grid system of wards centered by a communal park-like space, but thanks to Oglethorpe, Savannah’s grid system is orderly. The first square-centered wards were built close to the river, the life-blood of the new colony. Grids of wards centered by squares moved inland, to the south, as the population grew. Walk as far as you want, and explore the streets extending out, north, south, east and west from each square. 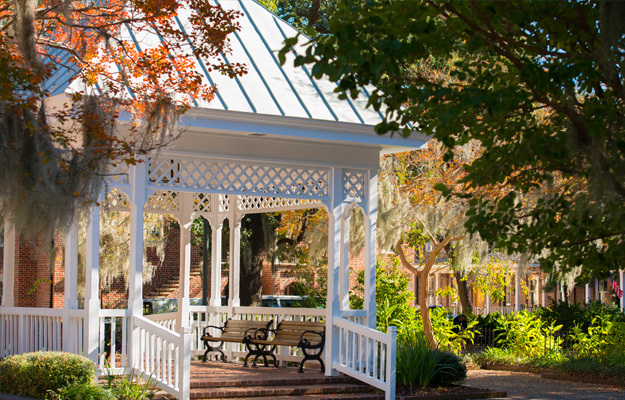 Sit on Forest Gump’s bench in Chippewa Square or go on a tour of the Owens-Thomas House. Walk through Colonial Cemetery off Abercorn; browse through an eclectic mix of stores, art galleries, bookstores and antique shops. Stop for a bite to eat; cool off with ice cream from Leopold’s off Abercorn; have tea at Gryphon off Bull. Make it to Jones Street, just south of Madison Square, where brick streets and moss draped trees are charming, the homes gorgeous. On any weekday, from 11am – 2pm only, lunching family style on real southern food in Mrs. Wilkes Dining Room is a must! Savannah’sHistoric District is known for its magnificent collection of historically and architecturally significant homes – over 1,600 of them! Surrounding and stretching out from the squares,they are the finest examples of Federal, Greek Revival, Gothic Revival, Italianate, Colonial and Victorian architecture found anywhere in America. From River Street to Forsyth Park they beckon with Savannah’s distinct charm. Look at details – the ironwork, masonry work, woodwork, windows, roofs, turrets, statuary, gardens. Don’t miss the dolphin downspouts. Go inside some of these fabulous historic gems on a house museum guide tour – Davenport House on Orleans Square; Andrew Low House on Lafayette Square; Green-Meldrin on Madison Square. If you want a comprehensive tour of Savannah’s collection of American architecture through history check out the Architecture & History Walking Tour. If the thought of so much walking around theHistoric District is just too much, take an Old Town Trolley Tour. You’ll see all the sights you came to see and learn about them too: River Street, factor’s walk, Waving Girl, all the historic homes and house museums, the squares, Cathedral of John the Baptist, Colonial Cemetery, Forsyth Park, and of course, the fountain – the list goes on. 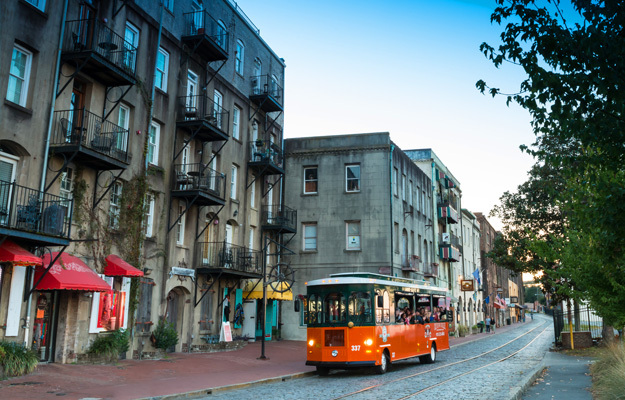 Two features stand out on this 90-minute tour: the great job the conductors do telling Savannah’s story, and the all-day hop on/hop off privileges. Old Town Trolley conductors really know Savannah and by they make sure you do too! They point out all the things you should notice, explain the history, architectural elements; they tell interesting stories of the people who lived here – all of it, the serious and the humorous. The hop on/hop off feature is great. As the trolley approaches each of the 16 stops along the route, the conductors will let you know what’s around the stop. If something interests you, get off, explore, shop, have a bite to eat, and when done, return to the trolley stop and hop on the next trolley that comes by. Just east of theHistoric District, on a bluff high above the Wilmington River is a lovely, serene cemetery, whose beauty is part natural landscape and part sculptural garden. Known for folklore associated with notables and ordinary people interred here, unique cemetery sculpture, tree-lined roads, lovely landscape, it’s a wonderfully unique place to visit. Established in 1846, this beautiful Southern Gothic “garden” or “rural” cemetery is straight out of the Victorian era, reflecting the sense, sensibilities and views of death and dying of that time. Death and mourning were romanticized through poetry, songs, rituals. Elaborate rural cemeteries like Bonaventure were just what they were meant to be: beautiful parks which encouraged people to walk through to appreciate the serenity of the landscape and the beauty of the art. It was their way of remembering. Enjoy it as the Victorians did; take your time walking, driving or traveling by Segway through it for a pleasant view. Getting out on the Savannah River on a riverboat cruise is interesting by day, but with the sun going down, painting everything it touches gold, and city lights glowing against the night sky casting a reflection of sparkling light over the river, it’s magical. Savannah’s riverfront is lined with good riverboat tours. To experience the night views, check out Savannah Riverboat Dinner Cruise. Whether you cruise on their stern-wheel paddleboat or riverboat, it’s great way to relax inside in a pleasant climate-controlled environment with plenty of viewing windows. So kick back, relax, take in scenic views, listen to live music and enjoy a dinner buffet with lots of choices. This is not a plantation house tour, it’s one of the first colonial homesteads which holds the ruins of the oldest standing structure in Savannah. It was the colonial estate of Noble Jones, a carpenter who arrived in Georgia in 1722 with James Oglethorpe. All that is left of his original tabby fortified home which was strategically built in 1745 on the tip of the peninsula overlooking the river and incredible marshes are tabby ruins. A mixture of oyster shells and lime, tabby was the building material of early settlers. Now a state park staffed by rangers, the grounds include a small museum, a walking trail that leads to the tabby ruins, and some added-on colonial era small replica outbuildings. The drive down the long entrance road canopied by magnificent, Spanish moss-draped live oaks is so scenically dramatic it will take your breath away. This alone is worth the 11 mile ride southeast of Savannah’s Historic District. If staff is available, rangers provide an interesting tour. If they are not, walk the trail to the ruins on your own and view the exhibits and a film about the colony’s history in the visitor’s center. If you like scenic beauty, simplicity and a glimpse into the life of early settlers, this beautiful property, with a mythical Gothic Southern aura, is a must see. Eco tours around the marshes on kayaks and small, shallow-draft boats are popular ways to get see this mysteriously exquisite landscape up close. Small, local operators who know how to navigate through the complex marsh landscape and extreme tidal changes abound. There’s another way to see great vistas of the marshes and more without stepping on a boat – zip line through the trees and above the tree canopy with Zip Tours of Hilton Head. Their friendly staff will teach you how to buckle and snap up, go over zip line safely, and go along for the ride. You start out slow and low for enough time to gain confidence. Then you’re off for greater heights and stop at 11 platforms along the way, where your guides point out the great views – the water, the tidal marshes, the wildlife. Out on the meandering Broad River, white boats criss-cross here and there. Careful looks might reveal a manatee, a dolphin, snowy egrets, and elegant herons. Stretching inland is the magnificent golden marsh, and the Atlantic Ocean glistens in the great beyond. The panoramic view from the tallest platform, 78 feet high, is awesome; the experience exhilarating! For views of spectacular Georgia coastal landscape, drive out to Tybee Island. Along the way, tidal marshes spread out forever on all sides. You will quickly notice what looks like marsh grass laced with meandering rivers changes quickly to reveal marsh grass surrounded by plough mud and oyster beds, not rivers. When the tide is low, the flats teem with wading birds and coastal wildlife. It is beautiful and fascinating at once. 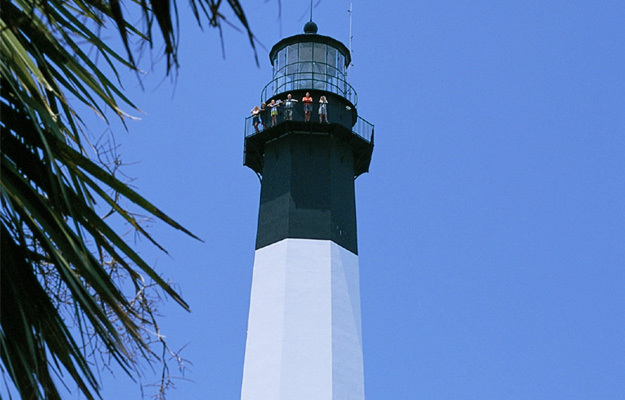 Climb up 178 steps to the top of Tybee Island Light Station-the view is spectacular! There are miles of gorgeous beaches here too, as well as plenty of places to fish off piers, from charter boats or even in the surf from the beach. Try one of the many restaurants, many serving fresh seafood right off the boats, browse through unique, artsy shops and galleries. It’s a fun as well as scenic day. To see the views from above, and add some adventure to your vacation, schedule a helicopter tour of the island. Atlantic bottlenose dolphin pods moving fast through the water in free abandon are a favorite. Look only to the dolphin downspouts all over theHistoric District and you’ll see they are not only fun to watch in nature but, according to local lore, they bring good luck! Sometimes seen swimming right along the bow of cargo ships making their way upriver, upriver, they are best spotted fishing and frolicking in the Atlantic Ocean. On a Dolphin Watch Tour aboard Dolphin Magic, conveniently departing from River Street, on the way out to the ultimate quest all the scenic components come together. 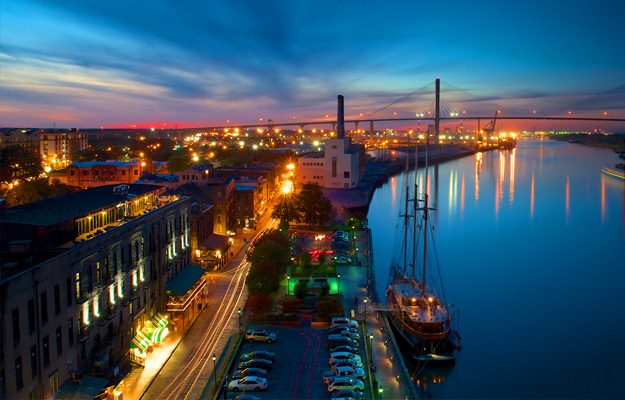 You’ll see Savannah’s skyline, the sights along the river, golden marshes, wading birds, forts, lighthouses, beaches, and of course, dolphin. Take a break from the rigors of sightseeing in a relaxing yet multi-sensory way. Seek out a locally-owned coffee house, bakery, tearoom, or chocolate bar tucked away on a Historic District street. All have an eclectic, inviting and visually pleasing ambiance. They are places to just chill, savoring delicious bites and beverages, freshly made, brewed and baked on site. Start the day off with coffee and specialty teas at Gallery Expresso on Bull, Savannah’s oldest coffee bar. Enjoy aromatic coffee with handcrafted made-from-scratch baked goods at Back in the Day Bakery, whose motto is “Slow Down and Taste the Sweet Life. Try a delicious breakfast or lunch at Goose Feathers in the Ellis Square area or Harris Baking Co. on Liberty St. for delicious tarts, pastries and great sandwiches. Satient Bean on E. Park opens early and closes late offering organic and fair trade homemade food, drinks, art and more. Try afternoon tea in the company of books at The Tea Room inside E. Shaver’s Bookstore on Madison Square. Gryphon on Madison Square for lunch or Sunday Brunch. Tasty, fresh seasonal offerings, friendly service by SCAD students, and delightful ambiance inside an old apothecary shop in the ornate 1926 Scottish Rite Building, it has all the ingredients.